Chapel Worship | Community Missions, Inc.
Each week, the Mission offers a Christian, ecumenical worship service. All worship services are open to everyone. Chapel Worship is generally 20-30 minutes long and includes prayer, music, scripture readings, and a brief sermon. During the first week of each month Communion (The Lord's Supper) is offered as part of worship. There are also special services and worship events held during the seasons of Advent, Christmas, Lent and Easter. Services are held on Wednesdays from 11:00 a.m. until 11:30 a.m. Attendance at the service is voluntary and Community Missions residents, kitchen guests, volunteers, and staff are welcome to attend as their heart leads them. Involvement in any Community Missions programs and services are not contingent upon participation in Chapel Worship or other faith-based opportunities we offer. 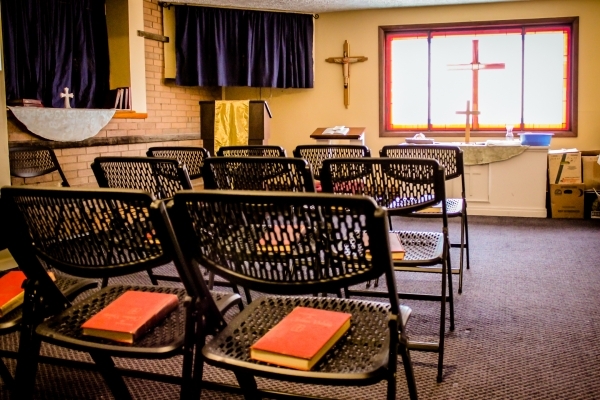 Our Chapel is made available as a prayer and worship space for people of all faiths and faith traditions to provide for the religious and spiritual needs of those we serve. If you would like to be part of presenting worship at Community Missions, or would like to help support our worship program, please contact Pastor Mark Breese at 716-285-3403 ext. 2259 or .